One of the best free flowering clematis Clematis Blue Angel will be covered with masses of flowers fromsummer through to autumn. Also known as Blekinty aniol the flowers are perhaps not as large as some but will still reach 10cm across. What they lack in size they make up for in numbers. 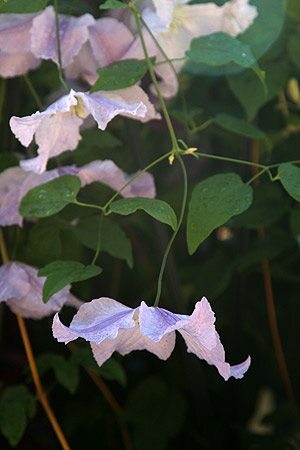 Clematis Blue Angel will reach around 3 – 4m in height and the flowers hang down gracefully. The colour is actaully a mauve to blue, ribbed lighter bars on the petals and yellow stamens. Most of the flowers will appear mid summer with a second flush of slightly smaller but equally attractive flowers in autumn. All clematis like to have a cool moist shaded root run and to be allowed to grow into the light and Clematis Blue Angel is no exception. Find a position where support is available, a climbing frame, fence or pergola. Dig in some well rotted compost and aged manure before planting and mulch around the base of the plant. This is a late flowering cultivar which means it will flower on the current seasons growth. Pruning is best carried out in late winter and we suggest that you hard prune Clemat is Blue Angel by 1/3 of the stems each year after 2 – 3 years. They can be cut back to last years wood right down near ground level. look for some strong new buds at around 30cm above the ground and cut to these. This pruning regime may seem a little harsh, however it will produce the best looking plant and the most flowers. Landscaping Uses – Climber on a fence, pergola or overhang a wall.